No, that’s not a Game of Thrones quote. It’s the last line of a 2010 documentary called Generation Zero, written and directed by Steven K. Bannon. Perhaps you’ve heard of him. Bannon is President Donald Trump’s senior counselor and chief ideologist. So great is his sway over the “leader of the free world” that Time Magazine recently dubbed him “the second most powerful man in the world.” He allegedly wrote most of Trump’s scathing inaugural address. He recently secured a seat in the National Security Council. And many observers see his fingertips on much of the administration’s initial flurry of executive orders, including the controversial travel ban. 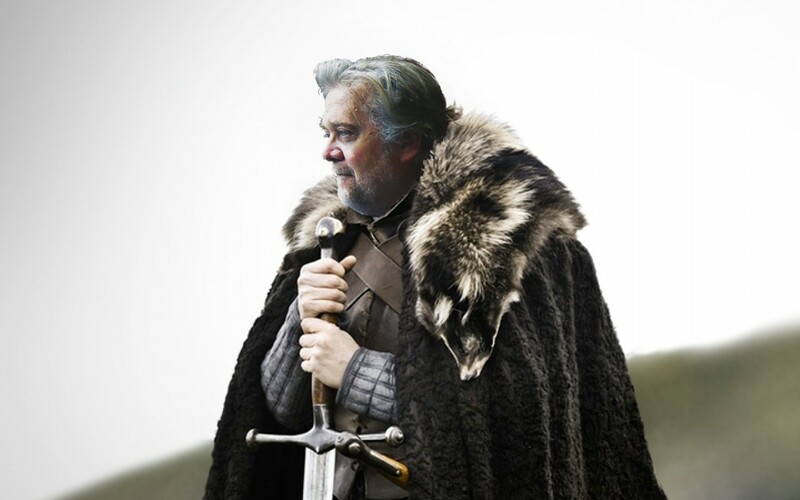 Given this power, understanding Bannon’s belief that “winter is coming” to America becomes urgent. His lurid documentary was entirely premised on a theory of history formulated by William Strauss and Neil Howe, authors of The Fourth Turning: An American Prophecy. Howe himself delivered the film’s ominous closing prediction. Strauss and Howe claimed that history runs in cycles, each lasting roughly 80 years. Each cycle, or saeculum, consist of four phases, or “turnings.” By “winter,” Howe and Bannon were referring to the hugely important “fourth turning,” a cataclysmic crisis that ends an era and ushers in the next. According to Strauss and Howe, all of the last three fourth turnings in American history culminated in wars, each bigger than the last: the Revolutionary War, the Civil War, and World War II. In “Generation Zero,” Bannon argues that the country is due for another fourth turning, and that the 2008 financial crisis, bailouts, and ensuing Tea Party reaction represented the beginning of the next one. It’s reasonable to infer that “at least as big” as World War II implies World War III. The first consisted of two pernicious strands of capitalism that he regarded as antithetical to what he called “enlightened capitalism.” There was the crony capitalism that was his chief target in “Generation Zero.” He also condemned “libertarian capitalism” for commodifying human beings. The second strand was “an immense secularization of the West” and especially the youth. All of this amounts to a bleak winter indeed. It might otherwise be dismissed as harmless crackpottery if it was not weaponized by Bannon’s sway over the man with the nuclear codes. True believers in rigid theories of history tend toward fanatical, impervious dogmatism. Every major development is interpreted as a portent that confirms their theory: as another step in the inexorable march of history. And all evidence to the contrary is ignored or dismissed as insignificant counter-currents within the grand, unidirectional flow. And historical determinists are rarely content to sit back and watch history unfurl. Like the Marxists, they often feel compelled to help along and hasten the inevitable. And prophecies of an inevitable war tend to be self-fulfilling when the prophet is in the position to start one. Steve Bannon, in bringing on the very winter he foresees, could be Cassandra and Agamemnon in one. Originally published at fee.org on February 14, 2017.